When the apologies for the design of Brussels Flower Carpet started emerging, some people got worried. The heat has had an effect on the colour, the design has to change at the last minute. Oh no! Would everything be dull? Would the green grass be brown? As it turned out, apologies were not necessary. The colours may be slightly different, but they are every bit as vivid as always, and the centre image of a bird – purple rather than blue – is gorgeous. 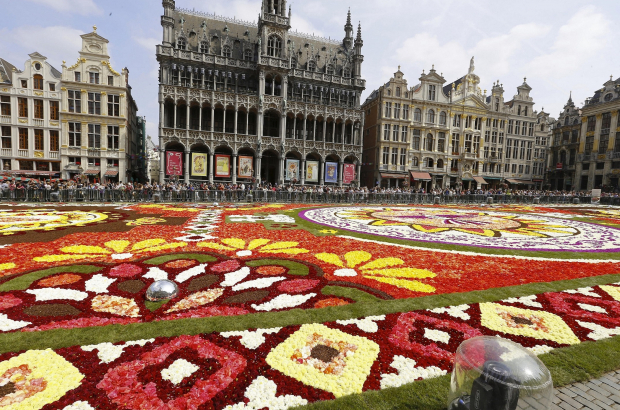 The biennial Flower Carpet on the Grand-Place, visible until the end of the day Sunday, is the most shared photograph of Brussels in the world. It is always an elaborate design based on a the culture of a country. This year the country is Mexico – specifically Uriangato, a town with a history of colourful street carpets made of flowers and sawdust, honouring its patron saint (who happens to also be Brussels’ patron saint, the Archangel Michael). Uriangato native Ana Rosa Aguilar Aguado, who goes by the artist name Roo, designed the carpet. The central bird figure is typically found in embroidery made by the Otomi people. It is surrounded by flowers to represent the wealth of Mexico’s fauna and flora. The central sun alludes to the main deity of the Purépecha people and the meaning of Uriangato, the shorted version of the name for the city, which translates as “place where the sun sets”. There are many other elements to the intricate pattern: a ceramic platter, which represents the great diversity in Mexican cooking, sacred bonfires, frogs, lanterns, warriors and representations of Saint Michael. Taking in all the elements together, this is the most complicated design of a Brussels Flower Carpet since the first one debuted in 1971. Grand-Place is freely accessible to the public, and a ticket can be purchased to climb the stairs of the City Hall and view the carpet from above – highly recommended.